As an experienced market leader in thermal systems, Grayson have been designing and manufacturing shell and tube heat exchangers to the highest specification for over ten years. Our shell and tube heat exchangers benefit from a flexible and versatile design, allowing them to be suitable for a range of applications both on and off-highway. We further the flexible capability of this product through our committed engineering team who can work with clients to create custom units to specific requirements in addition to the standard range that we offer. 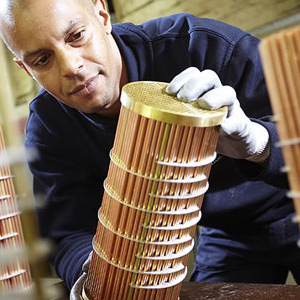 Our shell and tube heat exchangers have been carefully designed, specialising in optimum oil cooling, with copper brass inner tube stacks perfect for thermal conduction encased in a highly durable aluminium shell. Both single and two flow versions of our shell and tube heat exchangers are available. Our shell and tube heat exchangers are like all other products that we design and manufacture, meeting quality level ISO 9001 and meeting customer needs every time.